I love this race! I love a winter road trip to Traverse City! Late registration takes place around a roaring fire at the beautiful log lodge at Timber Ridge Resort. The pre race mood is just fun. Usual crowd about 240 entered and 100 rent snowshoes, probably their first time on them, so no excuse, come join us. The learning curve is zero, strap emâ€™ on and run. The low snowfall downstate always hurts winter tourism in the north. Itâ€™s hard to picture that there is snow just 200 miles north. The north woods are like stepping into a fridge, the snow stays through many a thaw, just plan on going now! The course is a super hilly off trail run with plenty of logs to jump and branches to duck, like a leg of DWD. There are a handful of very serious shoers at Bigfoot because it the Midwest qualifier for the National Championship Snowshoe race coming up in March. A 5 person U.S. 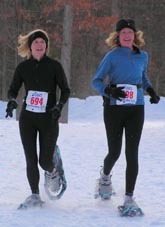 Team goes on from that event to compete at the World Snowshoe Championships. Serious stuff! Mike Decker, of Running Fit Traverse City and previous member of the U.S. Team, will be back to defend his Bigfoot title. Go Mike! There's nothing creepier than running into something while swimming in deep, murky Lake Michigan, even if it's just a plastic bag. When hiking in the backcountry, never forget that self-reliance is the rule of the land. Most likely you and your fellow hikers won't cross paths with many people, so what you are carrying is all you can depend on, making it a necessity to have the proper equipment and know-how. The United States and Canada have embarked on a joint effort to revive the lake sturgeon, the oldest and largest fish species in the Great Lakes region. So thirsty . . . While volunteers continue to clean up muck along the beach at the Bay City State Recreation Area, park planners are looking at new ways to bring in visitors. Entries for the first Trans Superior Singlehanded Division are now being accepted for the August 6, 2005 Trans Superior International Yacht Race. Since 1969 the Lake Superior Yachting association has held the Trans-Superior International Race every other year following the Chicago to Mackinac Island and the Port Huron to Mackinac Island races that are held in July. This 380 mile race starting in Sault Ste. Marie, Ontario, Canada clears the northern tip of the Keweenaw Peninsula and finishes in Duluth, Minnesota, USA, fully crossing Lake Superior from East to West. Lake Superior is not an ordinary body of water. With depths of over one quarter of a mile it contains 10% of the world's fresh water, enough to cover both North and South America under one foot of water or swallow up all the other Great Lakes with room for another three Lake Erie's. Water temperature at the surface can reach 60 to 75 degrees in the summer but the true deep lake temperature is 40 degrees which comes in to play when the wind kicks up.